Black Pen Knife With Multi-Functions | BUDK.com - Knives & Swords At The Lowest Prices! 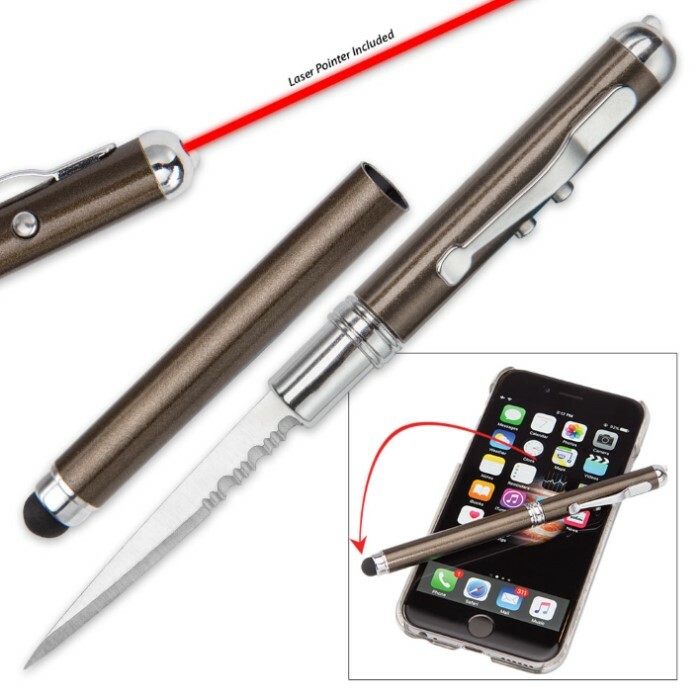 When you have this Pen Knife in your pocket, you have a handy multi-functional tool with you. This pen knife has a 2” partially serrated blade and the casing is a sturdy metal construction. 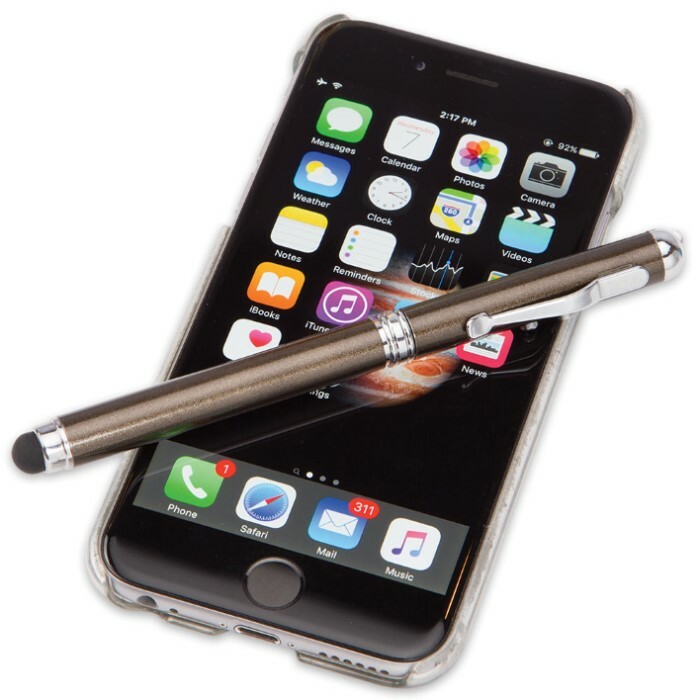 It features a smart phone or iPad/tablet stylus at the bottom of it and an LED light at the top. It also features an infrared light. The pen knife is 5” in overall length and has a pocket clip for ease of carry. I carry a high quality knife and led tactical Flashlight. 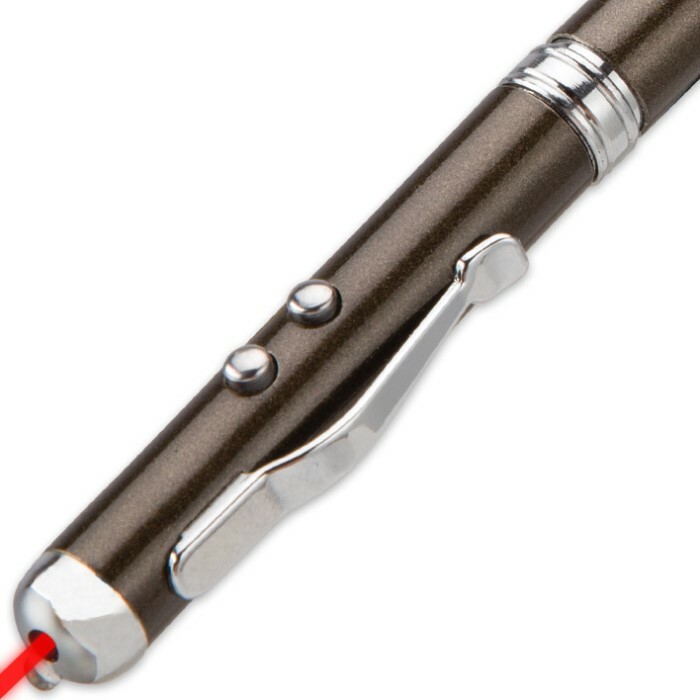 This device backs up those two and adds a laser and stylus. The blade seems delicate so I probably won't use it much. I can not say how much I love this thing:) it has a nice laser pointer and a powerful led light and the blade is long and sharp enough to open envelopes. I work in a very cold environment that I wear gloves and the stylus works great on the TC70 or the device we use to keep track of inventory at work, this works so well I do not have to remove my gloves at all when I have this. I will be getting more in the future. I liked that the 2 pens i received are black rather than the brown shown in photos. My cats live the red laser. I love the very pointy 2" blade + the light. My blade has only a half-inch portion that is barely serrated but that still should meets my needs. If they ever go bogo, i will buy for friends + coworkers. Would make awesome stocking stuffer for us big kids! The light and laser work well. The knife is sharp and the stylus is nice. You can unscrew the knife to change the battery's. I will give them as gifts. I bought two during the 15% off and free shipping sale to take a chance. My wife loved them. These knives are good. The knife portion is seated properly and it has a decent edge. The flashlight and laser pointer work fine. The I-pad stylis works and makes it look innocent enough for mixing among the non-tactical people. My wife told me to order more for Christmas gifts.